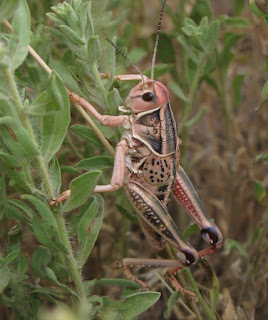 A couple of weeks ago I blogged about summer grasshoppers in the immediate vicinity of Colorado Springs. Since late May I have also had opportunities to travel to other parts of Colorado and found some very interesting species in those locations, too. Before I leave the city limits in the virtual sense, let me add two other species to the list. The Big-headed Grasshopper, Aulocara elliotti (above), is technically one of the slant-faced grasshoppers, but it has a very round face. It lives in the entire western half of the U.S. and adjacent southern Canada, ranging as far east as extreme western Iowa and Minnesota. It also slips far into the middle of Mexico. Look for it mostly in shortgrass prairies and desert grasslands with sparse vegetation. Even so, I encountered it at higher elevations in conifer woodlands. Go figure. 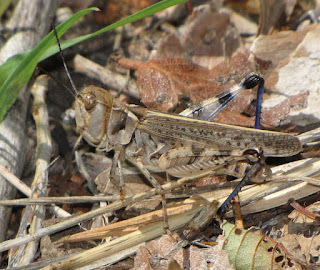 The big head, and bright blue hind tibiae, helps identify this species, which can easily be mistaken for a band-winged grasshopper. It can occasionally reach pestiferous population levels and become damaging to crops. The Western Spotted-wing Grasshopper, Cordillacris occipitalis, is unquestionably a slant-faced grasshopper. The long, white antennae are pretty distinctive. I noticed this species into late fall as well. 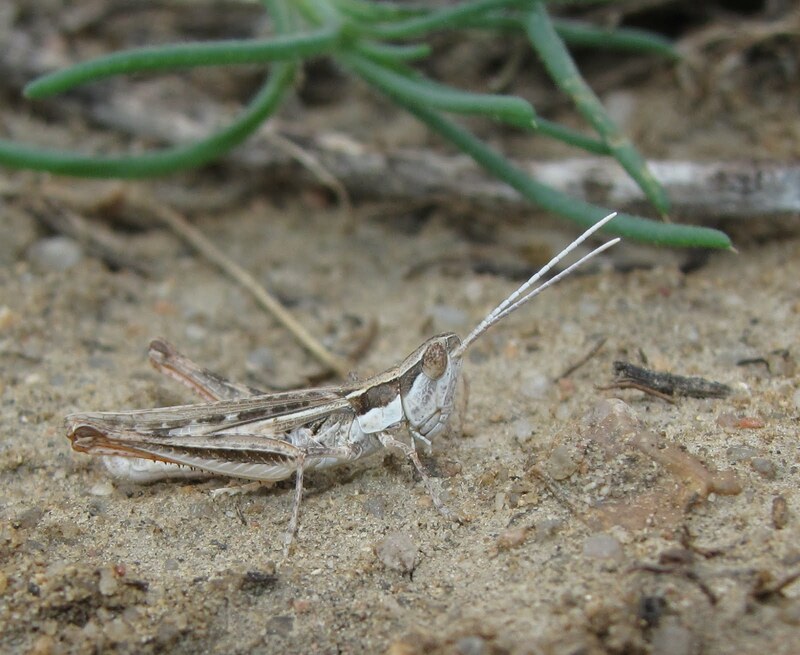 This is another shortgrass prairie species with a range similar to the Big-headed Grasshopper. It is likewise prone to population booms that can make it a rangeland pest. 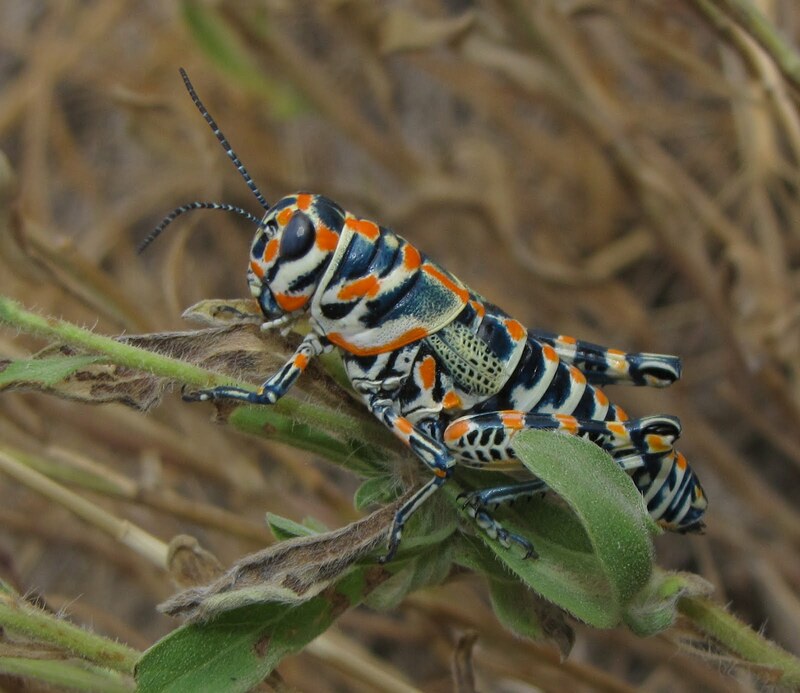 Farther out on the plains in El Paso County, one finds most of the grasshoppers found in city vacant lots, but in greater numbers. You also get other species like the big Coral-winged Grasshopper, Pardalophora apiculata, shown below. It ranges from deep into western Canada and south through northeast Washington, eastern Wyoming and Colorado, and south through Oklahoma, Missouri, Tennessee, and northward into eastern Canada. 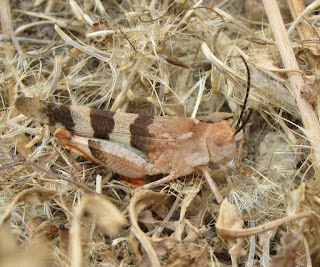 It is a mostly early- to mid-summer species in the adult stage. Females are heavy-bodied and reluctant to fly, which may explain why I was able to get so close to this one, in the middle of a road. This grasshopper gets its name from the orange or red hind wings, bordered with a dark brown or black band. A road trip between Cañon City and Pueblo that took me into more rangeland produced a trio of really spectacular grasshoppers. 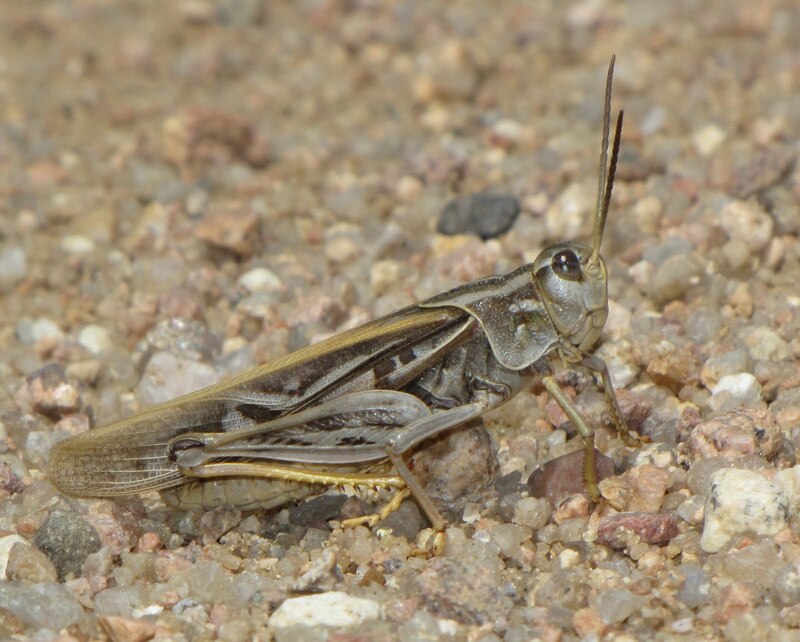 Just outside the Custer County Conservation District boundary, I spied a single specimen of the Three-banded Range Grasshopper, Hadrotettix trifasciatus. Large, and strikingly marked with three black bands across the front wings, it is hard to miss. Still, once it lands, it walks into dense grasses, making it difficult to get an image. Note the long, black antennae, and bright orange hind tibiae. The hind wings are pale yellow with a noticeable black band. This is a species of the Great Plains from Canada to Mexico, west throughout most of Arizona. It prefers to eat broadleaved herbs, but will stoop to feeding on grasses occasionally. 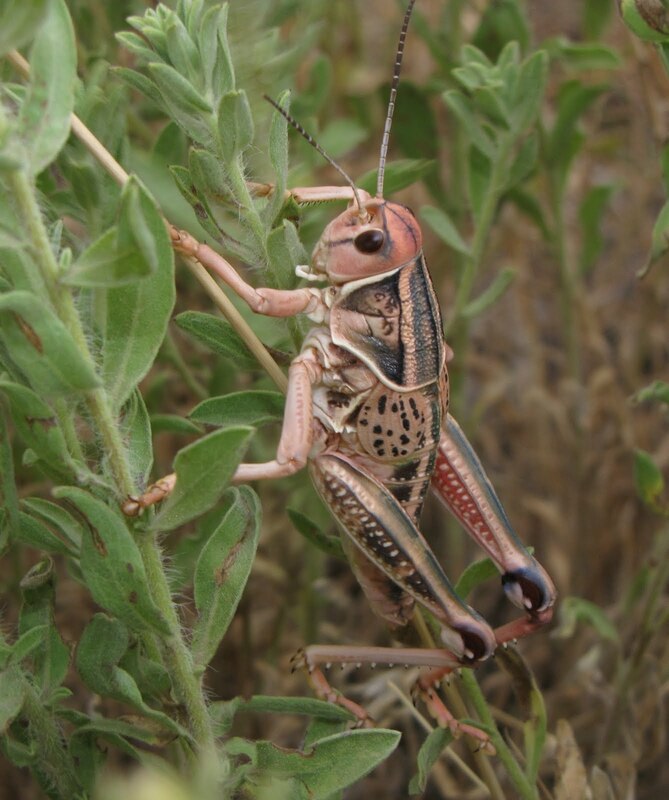 The largest grasshopper in Colorado is the Plains Lubber, aka “The Homesteader,” Brachystola magna, and I found one of those later on the trip. 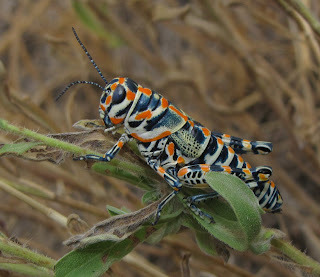 While the other grasshoppers profiled here belong to the family Acrididae, the Plains Lubber belongs to the family Romaleidae, which includes the Eastern Lubber Grasshopper and the Horse Lubber. 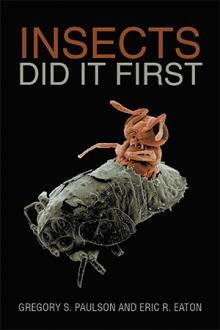 Brachystola is a wingless insect, even as an adult. It measures 40-60 millimeters, females on the higher end of that spectrum. It comes in a variety of colors, too. Some are green, some brown, some pinkish, some even bluish. The eggs of this species, typically laid in poor soil along roadsides and marginal rangeland, apparently pass through two winters before hatching. This may account for population booms and busts. While it feeds mostly on the foliage of sunflowers and various other broadleaved plants, it is also omnivorous, feeding on dead insects encountered in its wanderings. It will even eat road-killed members of its own kind. Large numbers of dead lubbers can grease the pavement, creating a real road hazard. 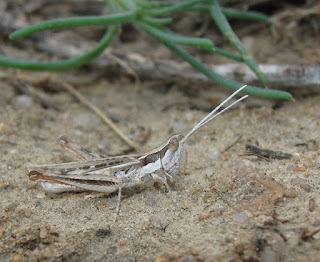 By far the most amazing grasshopper I saw was a by-product of trying to follow the Plains Lubber. 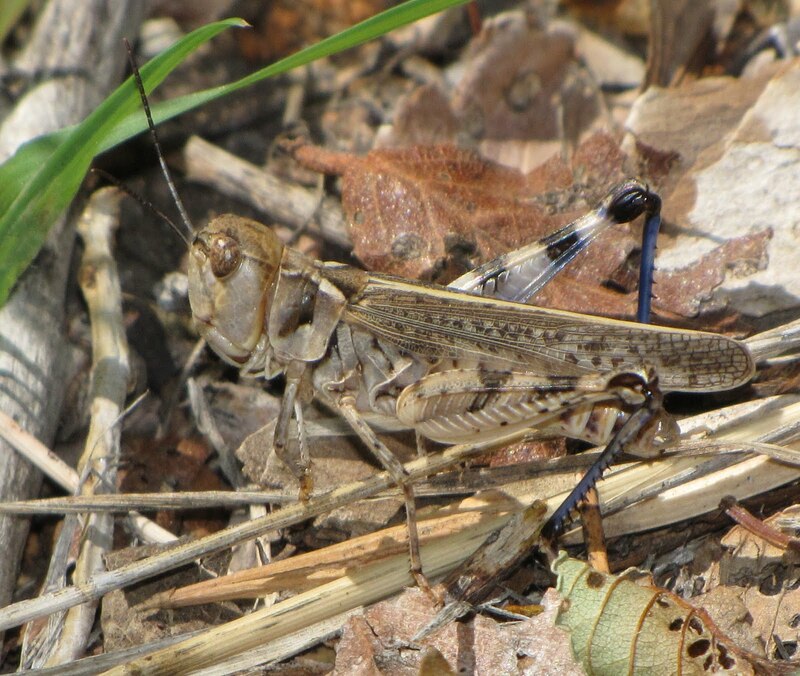 My jaw dropped when I spotted a red, white, and blue Rainbow Grasshopper, Dactylotum bicolor. Much smaller than the lubber at only 24-32 millimeters, this species more than makes up for its size with its color pattern. 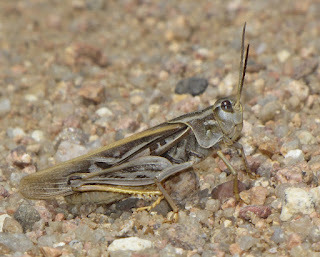 This is another grasshopper of the Great Plains, from Saskatchewan to Mexico. Like the lubber it is wingless in all life stages, and feeds mostly on low-growing broadleaved plants. The colors and pattern can vary from specimen to specimen and area to area, but it is always a stunning sight. I can hardly imagine any other grasshoppers that would be as thrilling to see as those last three, but I’m still in search of the “Green Fool Grasshopper,” so stay tuned. 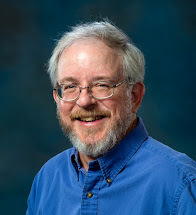 Sources: Capinera, John L., Ralph D. Scott, and Thomas J. Walker. 2004. 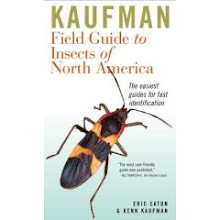 Field Guide to Grasshoppers, Katydids, and Crickets of the United States. Ithaca: Comstock Publishing Associates (Cornell University Press). 249 pp. Helfer, Jacques R. 1972. 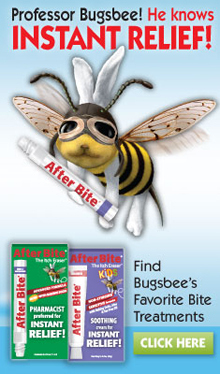 How to Know the Grasshoppers, Cockroaches, and Their Allies (Second Edition). Dubuque, Iowa: Wm. C. Brown Company Publishers. 359 pp. Wonderful post. Good to know there is so much variety of grasshoppers in Colorado. I'm going to look more closely at the grasshoppers around my home.